Spring and summer are at the starting blocks! Now is the time to spice up your assortment with summer classics: Our swing and climbing bestsellers impress both young and old high-flyers, and are simultaneously the boosters for your outdoor turnover!Whether it’s made of wood or plastic – whether it’s classic board swings, safe infant swings, net swings or disc swings – whether it’s climbing ropes or climbing nets – There’s something for everyone in our „Swings and Climbing Frames“ theme world! For fast orderers, we’ve got a particularly cool swing special*: With orders of three swings or climbing frames of your choice within the promotion time frame of 10.04. 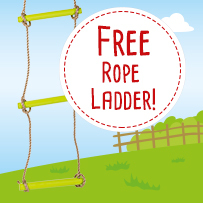 – 24.04.2019, you’ll get the Sky Stormer Rope Ladder 10878 for free! And here’s how it works: Simply enter the code FREE10878** in the shopping cart, and you’ll receive product 10878 for free along with the rest of your order. **Only redeemable 1x per customer number. Looking for even more fun for your garden assortment? Come take a look at our trampolines! You’re guaranteed to find more products here with which you’ll certainly score big with your customers and increase your sales.